Weight at Rescue: 79 lbs. Kami was rescued with the help of the Dallas World Aquarium. Her owner called them saying he could no longer take care of her, and if they couldn’t find a home for her then he would have to shoot her. The DWA informed us that she was living in horrible conditions, was under weight, and had never received medical care. Kami was living in an 8’x8’X10′ enclosure. There was debris from an old broken down den and a small rotted tree covering the bottom of her cage, making it difficult to walk around. She was declawed improperly which caused some of her claws to grow back, curl around and stab back into her foot. We brought her back to In-Sync, got her the medical attention she needed, had her spayed and had her claws fixed. We kept her isolated for a while before introducing her to other cats. 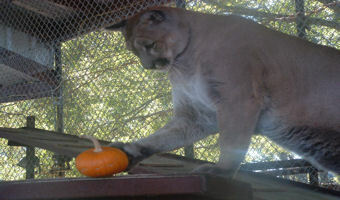 She now shares an enclosure with Freddie, Lassiter and Sierra. Although she does play with them from time to time, she has made it perfectly clear who’s boss. It took her awhile to warm up to us. Anytime we got close to her, she would hiss and run away. 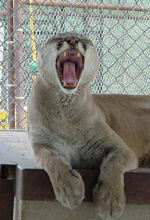 Our volunteers still gave her plenty of love and attention, and now she’s a happy, healthy, beautiful cougar. She lets us get close to visit with her, and on occasion you may even hear her purr.